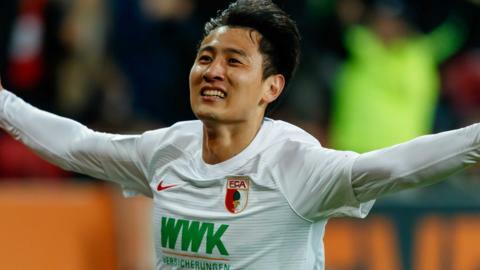 South Korea winger Ji Dong-won scores twice for Augsburg in shock win over Bundesliga leaders Borussia Dortmund. Bayern Munich twice come from behind to beat Augsburg and close the gap on leaders Borussia Dortmund to two points. West Ham defender Reece Oxford joins Bundesliga outfit Augsburg on loan for the remainder of the season. Former Arsenal goalkeeper Jens Lehmann has been appointed assistant coach at Bundesliga side FC Augsburg.